International Journal of Research in Health Sciences,2014,2,4,1125-1128. 1-Assistant Professor, Dept of Orthopaedics. 2-Registrar, Dept. of Orthopaedics. 3-Professor & Head, Dept. of Orthopaedics. 4-Junior Resident. 5-Professor, Dept. of Orthopaedics, Padmashree Dr. D. Y. Patil Medical College, Hospital & Research Center, Navi Mumbai, Maharashtra, INDIA. Displaced fracture of the acromion without associated shoulder injury occurs rarely. 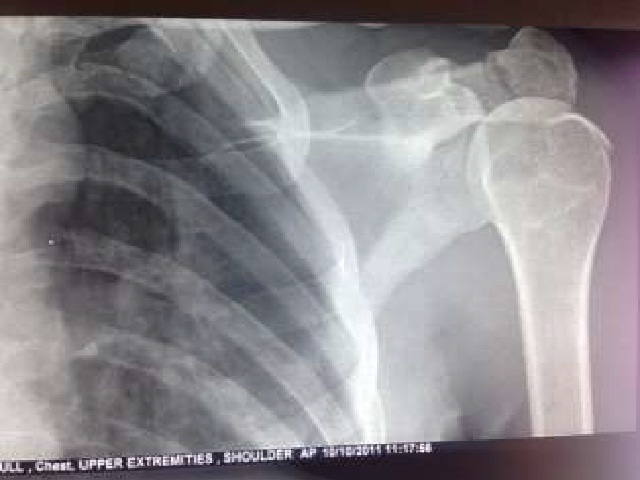 A 50 year old female presented with pain in the left shoulder following a fall from a 2-wheeler. She also had an associated history of head injury and blunt trauma to the chest. On examination, found swelling and tenderness over the acromion and the lateral end of the clavicle. The fracture was approached from superiorly and anatomic reduction was done. Fixation was with the means of 2 Reconstruction plates.